It takes all kinds of people to make a world, the expression goes. But maybe it really takes only two kinds. People who put ketchup on their fries, and people who put the ketchup on the side. People who squeeze gently from the bottom, and people who manhandle the toothpaste tube. 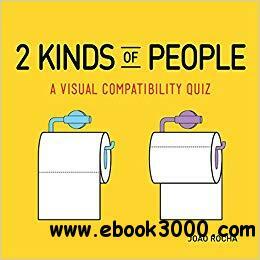 2 Kinds of People is the interactive visual personality quiz that's as much fun as a game. It works by showing two illustrations side by side. If you and your partner pick the same one, score it on the foldout wheel in the back, and move to the next. At the end, the number of matches determines where you fall on the Scale of Compatibility, ranging from mortal enemies to soul mates. There are 85 pairs in all, covering food, home, technology, travel, and more. It's the perfect icebreaker, a clever way to find out if you and your best friend/date/coworker and/or person you just met in a bar are compatible. Cup or cone? Cash or plastic? Shower or bath? Escalator or stairs? Toilet paper over, or toilet paper under? Like they say, it's the little things in life that really count.